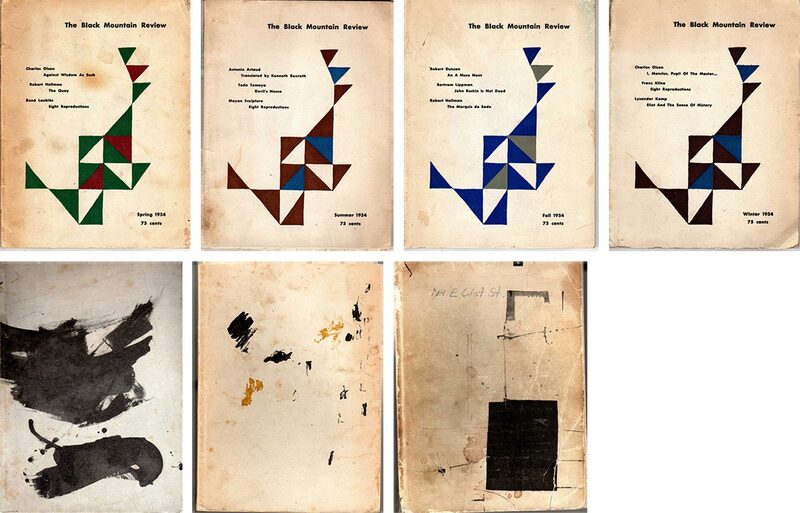 Covers of all seven issues of The Black Mountain Review, 1954-1957. Click to enlarge. Founded by progressive educator John Rice in 1933 near Asheville, North Carolina, by the late 1940s, Black Mountain College attracted key figures (or soon to be) in the experimental arts: John Cage, Merce Cunningham, Josef and Anni Albers, David Tudor, Clement Greenberg, Charles Olson, Robert Rauschenberg, Franz Kline, and Buckminster Fuller. By 1954, the College was on its last legs. In fact, the winter of 1953/1954 was arguably the lowest point in the College’s history. Out of this winter of discontent grew the idea of a literary magazine. Olson had turned Black Mountain into his own classroom and writers like Ed Dorn, Michael Rumaker, John Wieners, and Fielding Dawson attended the college. Robert Duncan and Robert Creeley along with Olson would teach at the College in its closing years. There were only seven issues of The Black Mountain Review published, as seen in the seven cover images above. I love these covers, and how the publishers began with the idea of a consistent design template with minimal differentiation, perhaps to create an identifiable “brand,” but by issue five their own artistic and experimental inclinations took over, obviously under the influence of John Cage and Franz Kline, and overthrew the rigid structure. It like a visual representation of a mind expanding. Beautiful. For large version of each Review cover, and more, see Black Mountain Review: Reports from the Bibliographic Bunker.